National Public Lands Day was yesterday. NPLD is the largest single-day volunteer effort for public lands in the United States. One of the traits that I have been trying to instill in Christopher is volunteering and that things just do not happen. Trails do not magically appear. It takes hard work and citizens like us to create them. The Trail Masons Association hosted a work day at the Wyandotte County Lake Park. This is one of our favorite trails to ride and Wyco just keep getting better. 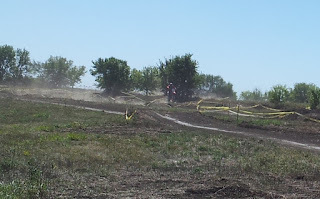 About 30 hard working folk showed up to make the dream of 20 to 30 miles of single track at Wyco a reality. Another dream is to have a endurance mountain bike event right here in the metro. Besides Bone Bender 3/6 Hour, there is no other off-road endurance mountain bike events close to the metro. That will change on October 20, 2012. The Wyco's Revenge Mountain Bike Race will be hosted at Wyandotte Country Lake Park. 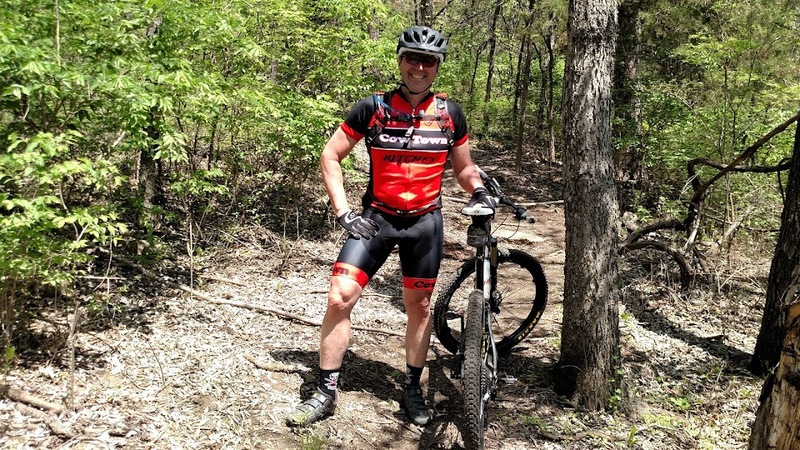 Christopher thought it would be great if there was an event that would grow along with the trails at Wyco. Together with Cliff Jones and the Trail Masons that dream will happen. As the trail system at Wyco is grown so will the Wyco's Revenge. The full Wyco Revenge will eventually grow to a 50 miler. I have wanted a Swiss Cross for years. Only thing was Tom Ritchey no longer produced them and finding an older model was hard. Lucky me Mr. Ritchey and the fine folks at Ritchey Bicycle Components decided to start producing the Swiss Cross again. A couple of months ago I picked up the new ride from The Wheel Cyclery and have looked at it ever since. The main problem was what to build her up with and I have had some nagging injuries the past couple of months. One in particular is a hip injury. Because of this the build process has been very very slow. Finally the Poser could not take it anymore and offered up a SRAM Red CX Groupo. I could not say no and found a renewed motivation to complete my dream bike. Christopher decided he might try a couple of cross races this year after the MTB season ends later in October. I told him he could race the Ritchey if he helped build her. Heck, he has a much better chance at doing well on her than I would anyways. I am trying to teach him how to build, maintain and repair his own equipment. We worked together on the Swiss Cross and I do believe she is a thing of beauty. I can honestly say this is one of my finest builds ever. 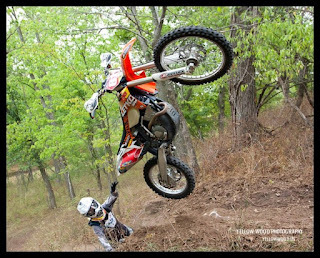 Round #12 of the Forward Motion Hare Scrambles Series was held in Merwin, MO. The location is the Midwest Extreme Park which has a sweet outdoor MX track and about 9 miles of trails. First up was a little pre-ride of the course. One of the reasons we are traveling to these events is to ride some new areas. Unfortunately there aren't very many open areas to ride so this is a great way to check out the awesome places to ride throughout the Midwest. Best Family sport.... I can not think of many sports that can match motorcycle racing. It is a great family sport that allows a family to build life long bonds. Two in a row....The past two weekends have been good to me. I got good start at both events and had a lot of fun riding the courses. I flowed very well when I kept to my own lines and was by myself riding my own race. I continue to have trouble passing riders in other classes. I actually crashed once and nearly took my head off on a large tree branch yesterday. Both times when trying to pass others riders who failed to yield to a faster rider who isn't even in their class. I can see not yielding to a rider in your class, but if a rider in another class comes up behind me yelling to get by, I let them safely by. That is the key word - Safely. Besides dead engine starts, this passing problem is the only negative about this sport. Anyway, it has been a long time since I was able to say I won two events in a row. Still a lot of learning....Christopher is a very good mountain bike rider and can out climb me and show me how it is done over very technical terrain; however, the old man still has a sport he can be on top. I will give this to him. He is trying to improve and is having a lot of fun in the process. 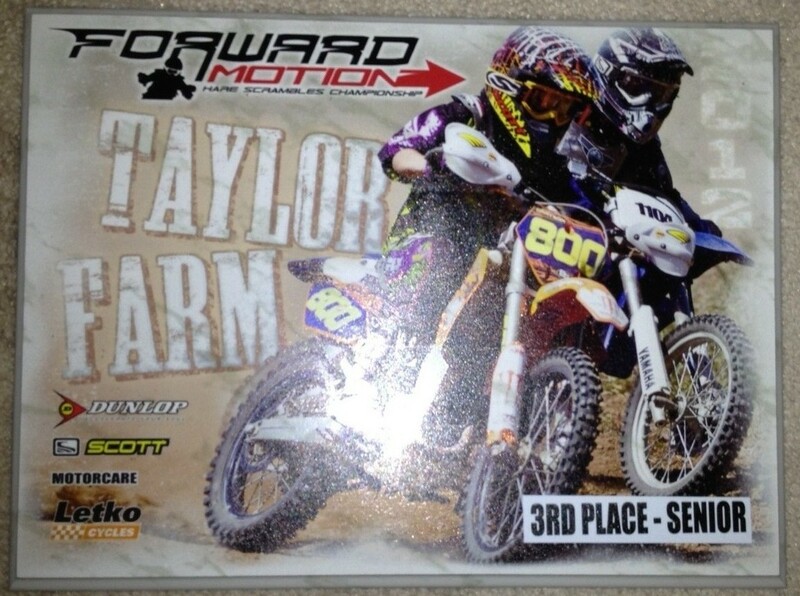 He got a dead last start and had a couple of mishaps out there Sunday, but still battled back to earn 2th place on the day. One other good thing is that I think he has finally come to the conclusion that the old man is correct that he needs to start focusing on his strength and train on a regular basis. It takes a lot of strength and coordination to "make" one of these 250 machines do what you want it to. The plan was to head down to the Tour de Lizard MTB race this past weekend, but work duties called on Saturday so we had to cancelled those plans. I was looking forward to racing and seeing how Christopher would fair against those Oklahoma riders. Next year for sure. The venue and course look awesome. A family ride was out because Carolynn had a funeral to attend on Sunday. It was either an easy long mountain bike ride or head to the next round of the Forward Motion Hare Scrambles Series. Christopher opted for the later so off we went to Melvern, Kansas. The course was said to be "beginner" friendly which I was thankful for. I was also thankful for the rain we received on Friday. A quick report from the venue was that they had perfect course conditions for the mornings events. Hopefully they would be the same for our 2:00 pm start time (the Melvern round also had split format with 1/2 the events run in the morning and the other 1/2 in the afternoon). First things first. While I was at work I remembered that I had not gotten a new battery for my bike. There was no way I was going to go through what I went through last weekend so I asked Carolynn to go pickup one for me. Luckily Sears had a battery available and cheap. I think a gel filled battery would have been better and lighter, but it was 3x as expensive. I have always had good luck with Die Hard batteries, but I never had to add acid to one for it to function. When I got home I was a little concerned that there would not be enough charging time before we left. Time will tell. The venue had about a 7 mile course and included a Endurocross course. I was a little concerned about this since Christopher had never ridden over something like a giant tire or a set of telephone poles. We watched several riders go over the obstacles and some did not fair so well. I heard some had some serious injuries - one broken leg and a broken clavicle. A quick note about the facility and the organization. The folks at Forward Motion have it going on. Their sign up process is very quick and efficient. Once you sign up for your first event of the year, your entry card will be in one of three boxes. You find your card, sign and date it and then go the the registration trailer. They simply scan the scoring bar code that is affixed to your helmet and you are go to go. As for the facility and land owners. All so far have been extremely nice and have provided a safe and fun atmosphere for families. I wish they would have some mountain bike races at these venues. The course at Melvern would make a fun mountain bike course. Christopher and I talked about this and he came up with an idea to have a MTB race on one day and then a Hare Scrambles the next. Two events on the same weekend and the landowner would bring in twice the income - encouraging more landowners into allowing us to use their land. At 1:00 pm we headed out for our recon lap. It was indeed an easy course, but might not be the safest. Because it was so easy and the course included plenty of long straights the speeds were high. The "black-loam" terrain of the morning turned into a "Blue-Groove" affair by the second start. Christopher did not like this at all. He likes a more technical course that is slower. So do I, but I can deal with this type of terrain also. We completed our lap without incident and headed back to refuel - both our bikes and our bodies. A little over 2 hours of hard racing was on tap so we needed to be ready. The new battery was working well. I still was not 100 % sure it had enough charge so once we got to the starting area I cut her off and lined up in my row. No practice starts for me. When the card did finally did turn sideways for the Vet 45+ class to begin I pressed that start button and was so revealed that she started that I actually forgot to put her in gear and go. That only lasted a few seconds and before I knew it I was sliding through that slick dusty first turn in around 7th place. The Endurocross section was up next and I somehow felt very confident that I would be in the lead before we hit the single track section. Well, I was correct. By the end of the first straight I doubled jumped myself into the lead. I rode my own pace and took it easy on the bike short shifting and using all the low/mid range power that bike had. My main goal today was to have a safe race and ride within myself and continue to get used to a motorcycle again. After the first lap I was still in the lead but only by 4 seconds. The race is was going to be at least 6 laps so I knew patience would come into place today. On next couple laps I kept catching other classes and had a hard time passing. I really did not feel like taking any chances or stuffing anyone. Eventually the other riders would let me by or they would make a mistake and I would quickly shoot past them. I would really make up time on the Endurocross section. The course was drying up quickly and was getting rough in some areas like the entrances of the corners. The braking bumps as they are called can cause you all kinds of problems. As I began the 5th lap I started to worry about Christopher. At the pace I was going I should have lapped him by now. I had already lapped the majority of his class but no sign of him. He was either have an awesome race or he had crashed. Turns out the later. He crashed on the braking bumps. He did precisely what I said not to - grab a handful of front brake while turning. His WR 250 did not run so well after that crash so he stopped after two laps. Thankfully he was o.k. Bikes are easy to fix, bodies not so much. The only problem besides passing I had on the day was my ability to focus. Riding a motorcycle fast once was very natural for me. Just like riding a bicycle is now. With a bicycle you can just go into the "pain cave" and pound away at the pedals. No so with motorcycle racing. During Sunday's event my mind would wonder some and I would start thinking about "hey wouldn't it be nice to ride a bicycle on the course" or "that was a long day at work yesterday". Then I would grab a handful of throttle and the rear end would just about come around on me because of the really slick corners. I kept having to really thinking about my riding technique - roll on the throttle, keep your weight centered, weight the outside foot pegs, keep that foot high so it does not catch a root, square that turn so you miss that big rock that is now in the middle of the course, etc. It was a fun event. I finished with plenty of energy left. Lead every lap and really made no mistakes, but this took a lot of focus. With time I am sure everything will become more automatic. It felt good to get a win and I am looking forward to racing the entire series next year. Christopher is also looking forward to more events. I think I will let him use the Honda to see how he likes it. I believe it is a much nicer bike than his WR. Lets just hope he keeps it in good shape and stays off the ground. I can honestly say that I never wanted a weekend to be over as much as last weekends. 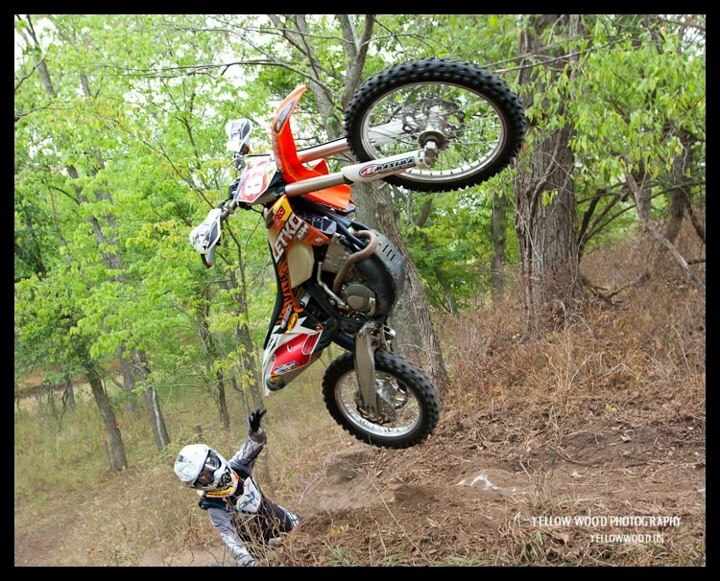 You would think a weekend of riding with your son would be fun, but I was a nervous wreck all weekend. For one it would be Christopher's first race on a motorcycle. He has ridden a few times, but finally asked if he could participate in a Hare Scrambles (Endurance Off-road Motorcycle race in the woods for those who do not know) This alone was enough, but add to it that we had to park outside this little hotel (Tioga Suits) in downtown Chanute with the only hotel security was a couple of young employees who appeared to be getting high with paint cans also know as "Huffing". Christopher described the process (how he knows I do not know and I did not ask.). I awoke Monday and quickly checked the bikes. Not that I got much sleep with all the noise downtown. How people live in a city is beyond me. I do not think it settled down until after 2:00 am. Then at around 4:00 am I heard a tow truck or something down by where we parked. All was good so I headed back up to make some coffee and get ready for breakfast. The hotel had a coffee maker with coffee in the room but no coffee pot or cups. Christopher found a pot and and I found a glass. Nothing appeared to be working but then I released that little safety plunger thing as it needed to be pressed to release the coffee into our makeshift pot. During breakfast I kept asking Christopher if he just wanted to go home instead of racing, but he really wanted to race so I ended up allowing him. He had all the protective gear and most importantly said he would ride within his ability level. There were 125 riders on hand which is a little low for this race which had to be moved to Labor Day weekend due to last weeks rains. We rode 4 laps on Sunday so we opted to just ride a partial lap in the morning. This turned out to be a nightmare for me. 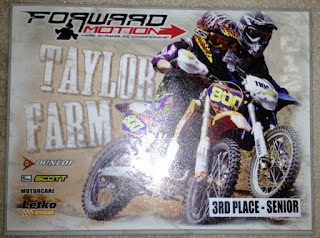 I stalled my CRF250X while turning to cut under some tape they had up for the kids race. My battery died on Sunday so I was left kick starting like the "good ole days". Normally this would not be a problem, but I have been nursing a hip injury. I have very limited range of motion in my right hip currently so kick starting is very hard. I just cannot generate enough power to get a full stroke on the kick starter. I ended up trying to kick start the beast which was not hot. After about 10 minutes I gave up. I told Christopher to ride back and get ready to race. I would just push the bike back. How many times did I kick start? Just check out the hole I wore in my boots. I also injured my foot because of the hole in my boot. Each kick resulted in a lot of pain after that. Christopher had the largest class of the day. There was a mix of novice riders and a handful of what one fellow riders call "Farm Boys" who ride year around but only race once or twice a year so they just sign-up in the Trail Riders class. This was one of my main concerns and wanted Christopher to just ride safe, continue to learn to ride and have a good time. As for me, I lined up on the outside and waited to start. I did not want to kill my engine because I knew I would have problems starting her. With Hare Scrambles you have a dead engine start and I was required to kill the engine. I did and hoped for the best. Well you can guess what happened next. When the board turned sideways and I went to start the bike and nothing. The 15 Vet riders in my class were gone. I tried in vain and gave up about about 10 kicks. The next row behind me (rows start in minute intervals) was getting ready to go. I push the bike off course and some great event volunteer comes over and offers his assistance. He tries and nothing. I tell him you have to hold the clutch in for it to start (safety feature). One more kick and she fires right up. I jump on the bike and take off just as another class is starting. I get to the turn/woods before they do and set off to enjoy the trails Like I mentioned above I just wanted to ride. So I am rolling on the throttle navigating the 7 miles course. I am minding my own business enjoying the ride all the while wondering how Christopher was doing. Turns out he had a very poor start like me. He was in the second row of his class. Due to his class size and limited starting area they had three rows of riders. I had told him that each row starts with 1 minute between each row. I should have said each class starts with minute intervals. Everyone in his class starts and leave him there. He realizes his mistake and gets going in near dead last. After a few miles I catch up to a pack of riders. I really had no intention of passing but every time someone made a mistake I ended up shooting by them. Before I knew it I was passing riders left and right and picking up my pace substantially. At the completion of lap one I glance up at the score board and saw that I was in 3rd place. I continue on and kept catching riders and passing them. Before I knew it was in full race mode and really hammering the course. At the completion of the 2nd lap I moved into 1st place. The next lap I maintained a good pace. Nothing too fast. I just wanted to ride safe and not crash or stall the bike. With our lap times I expected to complete 6 laps so I started thinking I should conserve some fuel. I really do not know many miles I can get on one tank. I shifted up a gear in most sections and just lugged the bike around - which is kind of my riding style anyway. Well being in one higher gear caused me to actually start riding faster. I limited my braking and started to flow very well and took the corners at a higher speed and also started to float more over the rough terrain. I was feeling awesome. Like old times on the bike. On lap 3 I had a healthy lead and felt I had the win in the bag if I just did not do anything stupid and crash. I saw Christopher at one point on the course where it had two way traffic. I waved and was very glad he was safe. All was good. Roll on that throttle baby! Looking back now I can only laugh. But at the time what happened next was very, very frustrating. I rolled on that throttle a little hard while navigating a small creek bed. There was an easy line on the way out and you had to be careful not to hit it with so much speed as to jump out of the creek because you just might hit the tree that was on the left which would cause you to miss the proceeding turn (which was still a little slick due to the recent rains) or worse crash. Well you guessed it. I hit the section with so much speed that I flew through the air. When I landed I tried to turn left to miss the tree but the Dunlop tires that came on the bike offered no grip (do not worry, I have a set of Kenda's on the way...). I tried in vain to save it but as I mentioned before I was riding a gear higher and was going way too fast. I was tossed like a rag doll to the ground. I get up quickly and run back to the bike and grab the throttle in hopes to keep the bike running. That was not going to happen on this day. She died and I about freaked. I compose myself and again attempt to start the bike. Nothing but exhaustion. My leg had no power what so ever. I push the bike off the course and start watching riders go by. After about 5 minutes I see what was 2nd place in the Vet class ride away. Then second, third, then fourth. At this point I just wanted to get a ride back and wait for a course worker to come by and tow me in. One finally does come and offers to try and start my bike. After about 5 kicks she fires up. I put my helmet back on and take off. I roll the next two laps and somehow managed to actually catch up to 3rd place and only 1 minute and 23 seconds out of first. Yes that is correct, I now qualify to race in the Senior class - class just for us old riders. As for Christopher he had a solid race and finished safely. He passed a lot of riders and actually worked his way up to 12th place. I think that is great for his first event, especially considering he really just started riding a few months ago on this full sized bike. The temperature was over 100 degrees on the day and he was exhausted after his 2 hour and 16 minutes on the bike. He now knows what I mean when I say that Motocross riders are some of the best conditioned athletes in the world. This weekend is the Tour de Lizard or another Hare Scrambles. I have to work on Saturday and do not know what time I will get off. If it's late we will have to miss the MTB race and instead have to go to the Melvern round. Christopher is good with either. I will tell you this, before I ride another Hare Scrambles I am getting a new battery. No more kick starting for this old man and his bum hip. Another fun weekend of training including heading down to Chanute, KS for a round of the Forward Motion Hare Scrambles Series. This will be Christopher's first attempt at a motorcycle race. To tell you the truth I am very nervous about the idea of him racing a motorcycle. We went a day early to ride the course so he could get used to it and decide if he really want to try it. Below is a short segment from part of the course which included some very virgin sections.